Join us at Camp Luther for a fun-filled weekend as we raise money to pay off the remainder of our pool loan. The main attraction for this Labor Day weekend will be an All Day Christian Concert held on Saturday. Groups from all over the state will be performing on 2 stages throught the day until we end the night with a big blowout concert from the group Lost & Found. We'll also have pool games, a silent auction, and more activities for all ages throughout the entire weekend. Come for the whole weekend, or just for the Saturday concert. Cabins, RVs, and tent camping are avaiblable, as well as day passes for the concert. See the Registration page for full details. Camp Luther is located in Conneaut, Ohio, in the northeast corner of the state. We're about 1 1/2 hours from the city of Cleveland, and 3 1/2 from Columbus. 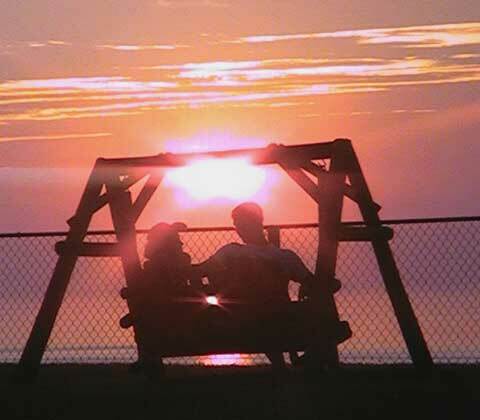 The camp sits on a bluff overlooking Lake Erie, providing beautiful views of the evening sunsets. For more information, please e-mail us at cwagonfield@hotmail.com , or call the camp office at 440-224-2196.